Rasmus Dahlin came to the Sabres on Friday, he saw, and he conquered. Dahlin was the team’s first draft pick – and the first overall choice – in Friday’s NHL Entry Draft. He’s made a good first impression on everyone as he has made the rounds of attention and hype that comes with his new status. 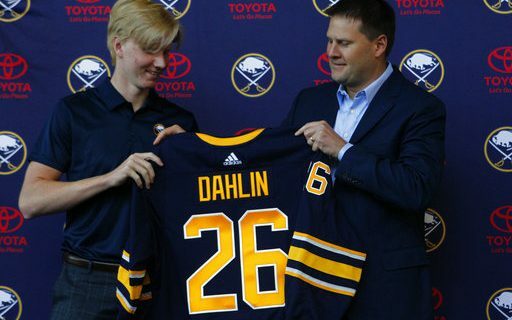 It all means that Dahlin has accomplished his first task as a Buffalo Sabres’ organization in record time: Change the subject. Let’s go back in time, all the way to mid-April. Most of the fans that spoke up seemed to be thrilled that the most disappointing season in Sabre history was finally over. They couldn’t wait to see that team dismantled over the offseason, so they wouldn’t have to spend money on tickets or spend time watching television for a substandard product. You can’t sell the present in that situation if you are in the Sabres’ marketing department. You have to sell the future. Times have got to be better in the future, because the present and the immediate past need to be forgotten quickly. Otherwise, some would be very tempted to cancel season tickets, etc. Rasmus has been making the rounds since he was picked by the Sabres, to the point where The Buffalo News had a reporter follow him around over the weekend. The team posted video of his plane arriving in Buffalo, and he apparently has done a few radio interviews. Based on the gleeful reaction of some fans and, yes, some media members, the plan has worked. People are counting down the days until the regular season opener to see what the kid’s got. On Monday morning, the Sabres turned up the publicity machine a bit to get people’s attention (as well they should). They had a full-fledged news conference in the lobby of the KeyBank Center, complete with a podium, photo opportunities and team employees in the background ready to raise the flag in a sense. Admittedly, 18-year-old hockey players aren’t known for their insightful quotes. The only player of that description to say something that was often interesting was Tom Barrasso. The goalie arrived in Buffalo out of Massachusetts with a reputation as a cocky young lad. Then after a preseason game, a reporter (not me) asked if he was a little down after giving up six goals in a loss. “Not at all – I couldn’t be blamed for any one of those goals,” Barrasso replied, and then he went on to break down where his teammates had gone wrong. The reporter thought to himself, this guy is going to be different. Still, Dahlin did fine – especially for someone speaking in a second language. He got the idea across that he was very excited about what has happened this weekend. When asked why he wore his new jersey on Saturday to the draft, he answered, “It was the best time of my life.” It was a nice contrast to Eric Lindros, who famously didn’t put on a Nordiques jersey after he was drafted first overall. Lindros eventually was traded to Philadelphia. Dahlin was briefed on the important parts of Buffalo hockey, such as rivalries. “I heard that Buffalo and the Toronto Maple Leafs had some hard games. That would be fun (to play in them),” he said. The only news to come out of the session was that Dahlin will wear No. 26 for the Sabres this season. Come to think of it, this probably was a bigger news flash to Matt Moulson, who wore the number last season before he was exiled to a California team in the ECHL. General manager Jason Botterill confirmed that Moulson would not be back with the Sabres next season; the winger will head for another NHL team or be loaned to a minor-league squad. Number 26 wasn’t an obvious choice, since defensemen often are assigned low numbers. No. 6 might have been a little too covered with pressure, considering that another Sabre defenseman wore it on his path to the Hall of Fame – and that guy, Phil Housley, will be standing behind the Buffalo bench as coach next season. But Derek Plante and Thomas Vanek did some good things with it, so Dahlin can use them for inspiration. The rookie-to-be will be on the HarborCenter ice for workouts and scrimmages starting Wednesday. Then he’ll go back to Sweden, get his life in order, and then come to back to Buffalo – with Mom at his side – in August to put together a new life. Dahlin will be carrying the hopes of everyone connected with Buffalo hockey, even if that thought has to be pushed aside. Which is all we can ask for now.